By a playing field I mean that there are parameters that define each and every real estate transaction. The edges of the game board for buyers and sellers are defined by some factors like Location, Condition, Motivation, the Season of the year and the Economy. And then, just to keep things interesting, there’s Luck. Just like when you have a Q but no U, is it just luck in real estate that your target Buyer is in the market at the same time you’re selling, for example? Or can you create good luck by working smarter? Is this pic of a recent Scrabble game an example of good or bad luck? Since I’m a glass is half full person, I’ll strategize and maximize my resources. And that’s exactly what good Realtors help their clients do! Just keeping the words of Winston Churchill in mind when he said, “never, never, never give up”. I love that age in children when they have the most fun making up rules to play by. Children instinctively know that a game is no fun if you don’t play by the rules. It’s my job to keep my clients well informed and protected by knowledge of the laws and rules of Real Estate. A surprising number of players struggle with this one. You know who you are 🙂 teehee! If you have a bad memory and can only remember one rule, make it The Golden Rule! Its called Negotiation. The art of giving a little to get a little. I find it helps to think in terms of a “successful” real estate transaction, especially in this economy. Of course every board game has a winner and a loser. (Jeeze I’m so old fashioned! Is it still a board game if it’s on my iPhone?). But what makes a successful transaction? I like to think that at the end of the day a successful transaction is where each party in the negotiation has gotten essentially what they needed. There is a critical difference between wants and needs, especially in a strong Buyers Market like this one. 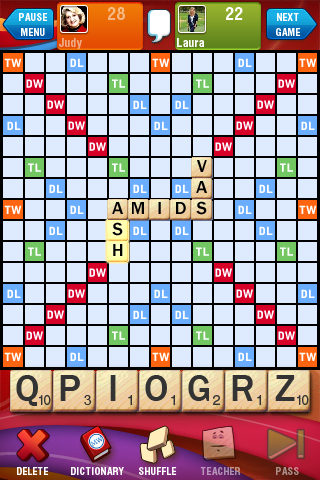 Don’t ya just love Scrabble Real Estate? This entry was posted on Tuesday, July 26th, 2011 at 5:50 am	and is filed under A Realtors Life, Chester County, Fun Things To Do, Home Buyers, Home Sellers. You can follow any responses to this entry through the RSS 2.0 feed. You can leave a response, or trackback from your own site.